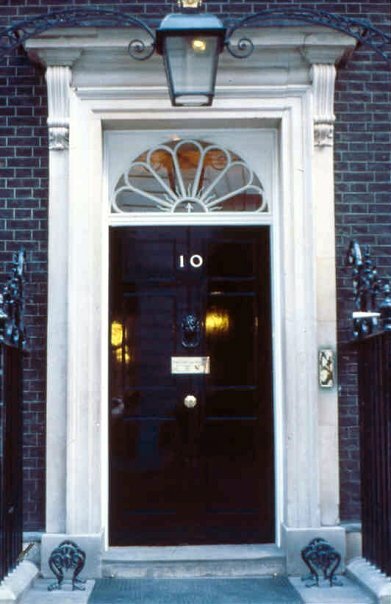 10 Downing Street in London is the official residence and office of the British Prime Minister. Number 10 was originally three houses. In 1732 King George II offered them to Sir Robert Walpole, who accepted them as a gift to the office of Prime Minister. Walpole commissioned William Kent to join the three houses together. I have carried out various colour and paint technical advice projects here. My company Papers and Paints has supplied much of the paint. I have written on the significance of front door colours. So the big question (and one that has driven me mad for years), Who makes the paint for the famous door (or rather for both of them)? I have no idea, but it looks very like a sprayed cellulose finish. Do you know what paint colour was used on the Downing Street staircase please? Many thanks! I don’t, I’m afraid. I have been up and down the staircase several times. It’s not a Papers and Paints’ colour, but we do have colours like it.